That the aborigines made fish-traps and fish-balks (as we used to call them when we came across them) is a fact. Sixty years ago there were many of the smaller balks in existence, and white people knew them and made use of them for other purposes than those intended by the aborigines. The larger fish-traps were made for the great gatherings, and were invariably based on a running reef or natural outcrop of rock. There were a number of these places of gathering known to my people, and I often heard them spoken of. One of these was on the Clarence, one at Brewarrina, one on the Upper Murray, and one down near Hay or Nerrandera – it was near the swamps between these two places, the swamps being sanctuaries. Where there were billabongs stone traps were not in use, as floods filled the bends and lagoons, and the fish had room to feed and grow as freshes replenished the supply. But on the long, slow waters of inland rivers stone traps were made where a suitable place was available, and these were keyed by temporary stones so that the size of the fish to go through them could be regulated. The keys on one smaller stone trap on the Upper Murrumbidgee were shown my father and the manner of them explained to him. They were so placed and fitted that the current would not shift them and they could not be embedded in silt after floods. They were keyed, spaced and angled in a certain way to meet force, and yet let the water through. Many early historical accounts written by European explorers and settlers described the fishing practices of aboriginal people in the southern Murray-Darling Basin. Ethnologists concluded that they were a nomadic hunter-gather people living a subsistence existence, moving from place to place as resources became available or were depleted. A number of historical accounts, however, suggest a different assessment and indicate that some aboriginal groups actively managed the native fishery and the aquatic environment. The permanent structures used by aborigines for fish management that are most commonly described in historical accounts, were wooden weirs consisting of vertical stakes driven into the stream bed intermeshed with smaller horizontal sticks or branches. These were typically built across creeks or anabranches leading into larger streams, usually below a small natural barrier in the watercourse. The rationale behind their operation was that when the streams rose during flood time fish would use the high water to pass over the weirs into the adjoining waters. When the flood waters ebbedm the fish trying to return to the main channels became trapped behind the weirs. The first account of native stick weirs in the basin came from Charles Sturt who observed them in anabranches of the Macquarie River in the Macquarie Marshes during December 1828: ‘We passed a singular scaffolding erected by the natives, on the side of the channel, to take fish; and also found a weir at the termination of it for the like purpose so that it was evident the natives occasionally ventured into the marshes’ (Sturt, 1833). Major Thomas Mitchell encountered native timber weirs during several of his expeditions, the first being in January 1832 in a creek near the Barwon River where ‘Drift timber and other fluviatile relics lay high on the banks, and several weirs for catching fish, worked very neatly, stood on ground quite dry and hard’ (Mitchell, 1838). They make stake weirs across the drains, the stakes being firmly driven into the soil within an inch of each other, so that anything having greater bulk than that space must perforce remain on the landward side of the weir. Without any stretch of the imagination, the reader can easily fancy the shoals of fish which congregate behind these weirs when the river is falling, and what a very simple matter the taking of them must be. When fish are required a native takes his canoe into the midst of one of these shoals, and harpoons as many as he wishes, or until he becomes tired of the fun’ (Beveridge, 1889). Mary Gilmore (1933, 1934, & 1935) discussed in detail two types of wooden structures constructed by aboriginal people in the Wagga Wagga area. The first were barriers placed across the entrances of lagoons using large trees that were felled and interlaced with smaller branches. She identified Pregan Pregan Lagoon at North Wagga Wagga as one location where these structures were used, as well as others at Edward Lagoon near Deniliquin, Narrandera and Bland Creek. She also witnessed the construction of one in Wollundry Lagoon near Wagga Wagga c1874. Gilmore received correspondence in 1935 from Miss E. A. Harwood reporting that similar large balks existed across creeks and in billabongs near the Murray River at Renmark as late as the 1870’s, and two at Markaranko Station above Morgan (Gilmore, 1895). The second type of structure reported by Gilmore were wooden balks or weirs, sometimes incorporating stone, constructed across gullies containing ephemeral creeks to form ponds. Their purpose was to provide permanent supplies of both water and fish. On some creeks they were numerous, with Gilmore (1934) stating ‘On creeks that were not constant, and in little gullies that only ran sometimes, I have seen scores of timber balks or traps.’ The ponds created by these small dams were progressively destroyed by settlers who either constructed larger dams over them, or used the balks as firewood. The last of them observed by Gilmore was near Ardlethan in 1880 (Gilmore, 1933). Careful planning preceded the construction of a fish trap. When a tree was found on a bank with the correct conformation (set of limb and length of trunk), the roots were partially undermined on the side facing the stream, and the next flood completed the task. With only their bare hands to do the work, members of the tribe guided the fallen tree downstream until it was time to manoeuvre it across between the banks. A lacing of small branches and rolls of grass was used to criss-cross the space below the tree trunk, and the careful interlacing of suitable poles held this net firmly in place’ (Carmody, 1981). Like Gilmore, Carmody reported that the wooden fish traps of the Upper Murray were destroyed by European settlers who used them for firewood. The historical evidence suggests that wooden weir fish traps on anabranches of the main rivers and in creeks was a technology that was widely used by aboriginal people in the southern Murray-Darling Basin. We had previously seen the osier nettings, erected by them across the various currents, and especially in the Gwydir, where some had been noticed of very neat workmanship. The frame of each trellis was as well squared as it had been the work of a carpenter, and the twigs were inserted, at regular intervals, so as to form, by crossing each other, a strong and efficient kind of net or snare. Where these were erected, a small opening was left towards the middle of the current, probably, that some bag or netting might be applied there to receive the fish, while natives in the river above should drive them towards it (Mitchell, 1838). 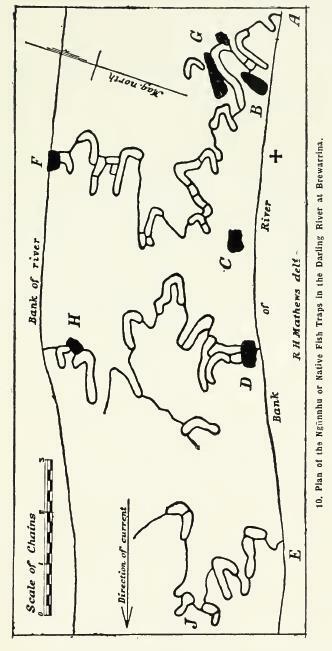 In 1836, Mitchell encountered similar but more elaborate structures in the Murray River near Swan Hill where one of his party ‘observed in the channel he traced a net or fence of boughs which the natives had that morning set up’ (Mitchell, 1838). Mitchell’s description of the structures as fences or boughs, led to them being colloquially named as ‘boughyards’. They were used extensively by the Yorta Yorta people of the Barmah Forest, with one reach of the river being named by Europeans as ‘The Boughyards’. Edward Curr (1883) recorded their presence in the Moira area and indicated that individual structures were owned by specific families, with the reliable food supply supporting semi-permanent settlement. Oral history of the Yorta Yorta suggests that these structures were not only used as traps, but may also have been used to improve habitat by providing additional cover for fish and spawning sites (Briggs, OH 70). Gilmore (1933, 1934) suggested that aboriginal people conducted a type of aquaculture operation in structures placed in the main river channels whereby large fish trapped in them would feed and grow upon the smaller fish that travelled into them. In early 1829 in ‘New Years Creek’, later known as the Bogan River, Charles Sturt encountered a stone weir about which he recorded in his journal ‘It was evident that the creek had been numerously frequented by the natives, although no recent traces of them could be found. It had a bed of course red granite, of the fragments of which the natives had constructed a weir for the purpose of taking fish’ (Sturt, 1833). There are about 8 chains more of the river floor containing fragments of old fishing pens, but I did not include them in my survey, and therefore they do not appear on the plan. / The rock F is supposed to be haunted by evil spirits called Wundurramala. If a strange blackfellow were to interfere with the fishing pens, these spirits would cause some accident or sickness to befall him. The blank spaces on the plan were, in the olden days, studded with fishing pens, of which the wreckage is visible in many places in the shape of scattered boulders and indistinct outlines of former enclosures. But the whole of the river floor was not occupied with the maze of traps. 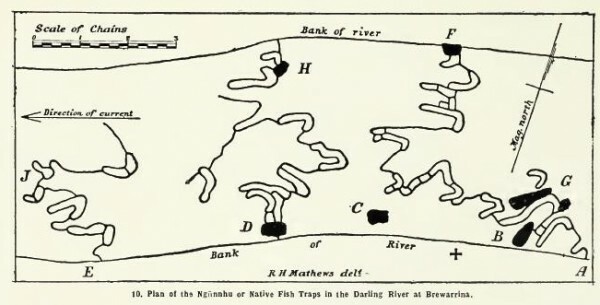 A waterway had to be left for the fish to travel up to the catching pens of families located higher up-stream (Mathews, 1907). While aboriginal people were reported in the twentieth century to have taken fish from the Brewarrina structure, active interest in maintenance and management of the structures ceased after 1899 (Sydney Morning Herald, 30 October 1915). In 1933, David Stead published an article in the Sydney Morning Herald describing the Brewarrina structure, concluding it to be a natural feature having undergone minor improvement by the aborigines and that its primary use was as a fish trap (Sydney Morning Herald, 30 September, 1933). Shortly afterward, Mary Gilmore responded to Stead’s article in the paper (Gilmore, 1933) and in a radio interview where she said that Ngunnhu was not unique, but in fact part of a network of stone fisheries that existed throughout NSW. She went on to report that they were not managed as simple fish traps. Further details were provided later in a number of books that she published (Gilmore, 1934; 1935) and Gilmore’s recollections are summarised below from all of these sources. H. Mathews published this photograph of the Brewarrina stone fisheries in 1907 in his book Notes on the Aborigines of NSW at a time when it was still in good repair. This plan of the Brewarrina Stone Fisheries was created by early ethnologist R. H. Mathews in 1901 who published a detailed history on them in 1903. He provided this plan in his book Notes on the Aborigines of New South Wales published in 1907. 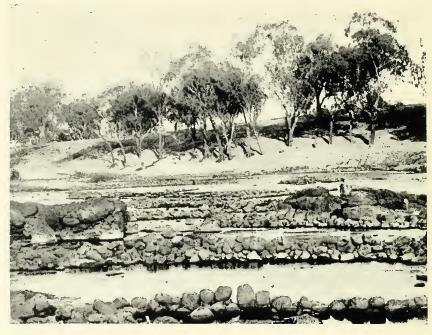 Extensive stone fisheries once existed in the Clarence River, in the Barwon River at Brewarrina, the ‘Upper Murray’, the ‘Upper Murrumbidgee’, the Murrumbidgee River between Narrandera and Hay, the ‘Lachlan River’ (Gilmore, 1933) and at Wagga Wagga, as well as others of lesser stature in the Murrumbidgee (Gilmore, 1934; 1935). A significant trap also existed in the Bland Creek at McGregor’s Station near Morangarell though Gilmore (1934) did not make it clear whether it was of stone or wooden construction. Gilmore spent her youth in the Wagga Wagga area and all of the locations reported by her to have the stone fisheries, with the exception of the Clarence River, were either in the territory of the Wiradjuri nation, at the boundaries of adjacent aboriginal groups, or within the land of those adjacent groups (Ngemba, Dhudhuroa, Ngnunawal and Nari Nari groups). Gilmore witnessed the use of some these structures, and received first-hand accounts from her farther Donald Cameron who learnt from, and assisted the aborigines in their operations during the 1860-70’s. She reported that the large stone fisheries were operated as an aquaculture system rather than just as traps. The stone fisheries had three primary functions. Firstly, the larger examples were used to trap and then grow larger fish for planned large corroborees, which she termed ‘inter-tribal gatherings’, to sustain at times upwards of five thousand people for several weeks. Their operation involved planning two or three years before their anticipated use, with keystones being removed from the fisheries at least a year prior to the gathering allowing large fish to move into them. The keystones were then replaced, trapping the larger fish but allowing free passage of small fish into the fishery. The small fish provided a food source for the large ones which continued to grow. In addition, a large sanctuary was declared adjacent to the fishery to increase the populations of other food sources. Thus a guaranteed supply of large fish, kangaroos, possums and birds was on hand by the time of the gathering. Secondly, the fisheries were used as an emergency food supply by tribal groups passing through the territories of the local tribe. Thirdly, stone fisheries along with wooden baulks, partitioned the streams permitting management of the fishery (Gilmore, 1934). Gilmore reported that the stone fisheries were removed to make the hearths of the fireplaces in the homes of European settlers (Gilmore, 1933) while others were blasted out by the desnagging crews clearing obstacles from the rivers for riverboat passage (Gilmore, 1934). From observations of aboriginal management of the large fisheries, some white settlers knew in advance of the large gatherings that would occur. This knowledge sometimes resulted in corroborees being the sites of some massacres. The Brewarrina trap probably survived because it was upstream of the routes used by the paddle steamers. Gilmore (1934) indicated that the last use of a fishery for an inter-tribal gathering was on the Bland Creek in 1879. Later authors recorded gatherings at the Brewarrina fishery, but these appear to have been the survivors of the local tribe rather than the traditional intertribal meetings of the past. Often, on long stretches of open water, stone traps were made, with the inclusion where possible of overhanging rocky outcrops for added strength. These traps were set so cleverly that they could not be swept away by the swiftest current or clogged up with silt at times of flood. Not only were these traps built to give the aborigines a change of diet, but they were especially used at times of inter-tribal conferences, the Upper Murray being one of the centres where these large gatherings took place periodically. To ensure a plentiful supply of fish for the participating tribes, the trap would be closed with a special key stone twelve months beforehand. This would allow small fish through, holding back the adult fish, which were later ‘harvested’. In addition, the surrounding countryside would be left undisturbed, to guarantee a supply of wild game at the time of the meeting (Carmody, 1981). Secondly, physical evidence remains of one of the stone traps described by Mary Gilmore in the Central Murrumbidgee River. 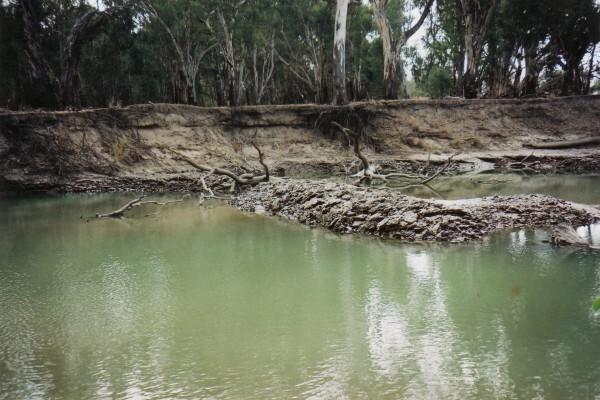 Mac Hardie, a retired sleeper cutter at Darlington Point, has provided the author with a photograph of the remains of a stone fish trap in the Murrumbidgee River that is visible in very low water conditions. He has speculated that due to the depth of water present within it, the aboriginal people may have used it for growing fish rather than simply trapping and spearing them. Mac has suggested that the large extensive trap used for intertribal meetings reported by Mary Gilmore may have been located near Carathool where the river passes over a bar creating a natural barrier and upstream pool (Mac Hardie, pers. com.). This matches Gilmore’s description of it being located between Narrandera and Hay, with the extensive anabranch and lagoon system mentioned also present (Gilmore, 1934). R. H. Mathews (1907) implication that other stone fisheries were operated by tribes upstream of Brewarrina also supports Gilmore’s accounts. This image records the remains of an aboriginal stone fishery in the Central Murrumbidgee River and validates the accounts provided by Mary Gilmore of these structures being present in rivers throughout the Murray-Darling Basin. Photo courtesy of Mac Hardie. These pieces of evidence triangulate Mary Gilmore’s accounts which indicate that there was a network of stone fisheries in the Murray-Darling Basin. Some were operated as aquaculture grow-out systems and used to support intertribal meetings. Oral tradition sourced from a number of people by the author, suggests that large stone fisheries existed in the Upper Murray as well as near Canberra or Cooma. It appears that smaller traps, alluded to by Gilmore as existing in the Murrumbidgee River, were common in some areas such as the Upper Murray River, this is supported by Carmody (1981). An aquaculture system growing eels within stone enclosures was used by the Gunditj Mara people in the Lake Condah area of western Victoria, and substantial physical evidence of this practice survives (Lourandos, 1997). It is clear from the accounts of the operation of wooden boughyards and stone fisheries that aboriginal people in the larger rivers of the Murray-Darling Basin conducted an equivalent form of aquaculture. A related story in on Riverspace with aboriginal people talking about Baiames-nghunnu: Brewarrina Fish Traps. A number of early European accounts, including those of Beveridge (1889), considered the netting practice of aborigines to be wasteful, with unused small fished left to rot. Other accounts such as that of Blandowski (1858) indicate that even the small fish captured by netting were at times used. Mary Gilmore concluded that native fish as a resource were actively managed by aboriginal people. The large gatherings at the stone fisheries were described by Gilmore (1934) as ‘intertribal conferences’ which occurred not only for cultural celebrations, but also as conferences for resource management. At these times were formulated tribal boundaries, as well as securing agreements about regulations on the operation of sanctuaries, fishery closures, etc. The construction of barriers on lagoons and anabranches, as well as the smaller rock traps, took place in part to manage fish populations. In particular, she reported that aboriginal people had the belief that excessive numbers of large Murray cod were deleterious to the health of the fishery and that the creation of barriers restricting the movement of large cod allowed their impact to be ameliorated (Gilmore, 1933, 1934). This was a belief shared by some early commercial fishermen such as William Hill (Hill, OH 37) who may have acquired this view from the aborigines. Gilmore identified specific locations where permanent or seasonal closures to fishing took place. Some of these places were the swamps adjacent to the Murrumbidgee River between Narrandera and Hay which were aboriginal ‘sanctuaries’ (Gilmore, 1933). In a chapter of her book Old Ways titled ‘native sanctuaries’, she identified a number of locations dedicated to the conservation of emus and waterfowl, and notes that ‘each year a part of the area could be hunted or fished, but not the same part two seasons in succession’. These included Pregan Pregan Lagoon near Wagga Wagga and swamps near Ganmain, Deniliquin and Deepwater. Lakes Cargelligo and Cowal were also managed sanctuaries, with only one side of Cargellico being opened to fishing annually. Lake Cowal was used as an alternative at times to manage the Cargellico fishery sustainably (Gilmore, 1934). Other wildlife sanctuaries in the basin are listed in Gilmore’s extensive works including some in the Monaro and upper Abercrombie River. In those days they would get the female cod in the breeding season and if they had the eggs, they would squirt the eggs out of the female into some logs and get the milt out of the males and put it on the eggs. They’d make up a yard out of the logs; protect it with branches, in a foot or so of water, only if the temperature was right. After 28 days the eggs and young cod would be gone. The old people did that for years. That was before any of the inspectors were doing it, in the 20’s, dad told me about it. It had to be done at the right time during the floods, the fish used to go out there and do it themselves (Briggs, OH 70). The first documented account on the artificial propagation of native fish occurred on the banks of the Murrumbidgee River near Oura in 1905, when Harald Dannevig successfully stripped and artificially fertilised cod eggs (NSW Fisheries Report, 1905; Sydney Morning Herald, 30 May 1905). It is possible that aboriginal people subsequently learnt this procedure from Europeans and applied it themselves. Gilmore’s accounts, which date from the 1870’s, indicate that aboriginal people had knowledge of the spawning sites of native fish and the ability to source ova for translocation purposes. Given this depth of understanding about the biology of native fish, it is plausible that aboriginals may have been propagating some species prior to the arrival of Europeans. At the very least, their translocation activities may have been responsible for the presence of some species in parts of the Basin, for example, Blackfish found upstream of large waterfall barriers today. This story is a chapter in the True Tales of the Trout Cod book written by Will Trueman. You can learn more about True Tales on the website that has a range of videos complementing Will’s wonderful research. Australian Government, 2003. Brewarrina Aboriginal Fish Traps (Baiame’s Ngunnhu), New South Wales. Department of Sustainability, Environment, Water, Population and Communities, Canberra. Carmody, J. 1981. Early Days of the Upper Murray. Wangaratta: Shoestring Press. Gilmore, M. 1934. Old Days: Old Ways. A Book of Recollections. Sydney: Angus & Robertson. Gilmore, M. 1935. More Recollections. Sydney: Angus & Robertson. Lourandos, H. 1997. Continent of Hunter-Gatherers. Melbourne: Cambridge University Press. Mathews, R. H. 1903. The Aboriginal Fisheries of Brewarrina. Journal of the Royal Society of NSW, 37: 150-153. Mathews, R. H. 1907. Notes on the Aborigines of NSW. Sydney: W. A. Gullick, Government Printer.